Continues through February 6, 2013. Noted Los Angeles abstractionists Ned Evans and Charles Christopher Hill share a potent double bill at Gallery 478 in San Pedro. 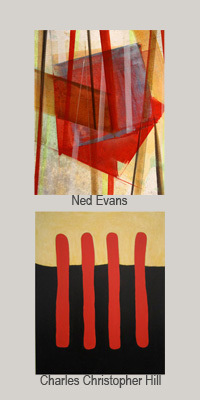 Both Ned Evans and Charles Christopher Hill have exhibited extensively in the United States and abroad and are most familiar to Southern California audiences. And both share a pronounced affinity for the effect of "facture”, the physical process responsible for producing the surface of a picture. In Ned Evans’ most recent paintings, color is applied in broad strokes and thin washes so that even as the intersecting planes of color collide and accumulate, the luminosity of underlying layers shines through. Often painted wet on wet, Evans’ brushwork yields animated, rhythmic patterns. Charles Christopher Hill’s current stripe paintings are reductive, hand-wrought, quasi-geometric works of limited palette. Multi-layered bands or bars of red float in horizontal or vertical stacks above quiet, neutral grounds of tan or off-white offering stark contrasts, physical assertiveness, and pictorial insistence.